With the approaching tidal flow it became really cold and wet from below and at the same time it became warm and later hot from the fire. I was sandwiched between the atlantic and fire. And I had my eyes closed, once a flower touched my face when falling and it was a nice and tender and different from human touch. One shoot full HD video loop for flatscreen (based on live-ritual-performance), 45:00 min. Audio: You listen to Christoph Both-Asmus (Artist) in conversation with Prof. Francis Hallé (Botanist) and Prof. Phillipe Danton (Botanist) about “The Tree Walker - project” (see work section), the rain forest canopy, the origin of humanity and the mystery of life. I had been thinking of the green cross for quite while: A symbol of aid for both human and nature. I’d like to dedicate this performance and photograph to this idea. The ritual was originally performed by Christoph Both-Asmus, in order for himself to connect with a place. After a flight to the other end of the world, he would go for extensive walks and collect flowers to arrange them in burning charcoal. Soon this ritual grew into a live-ritual-performance also to give an opportunity to others to reconnect and to slow down with and within their environment. 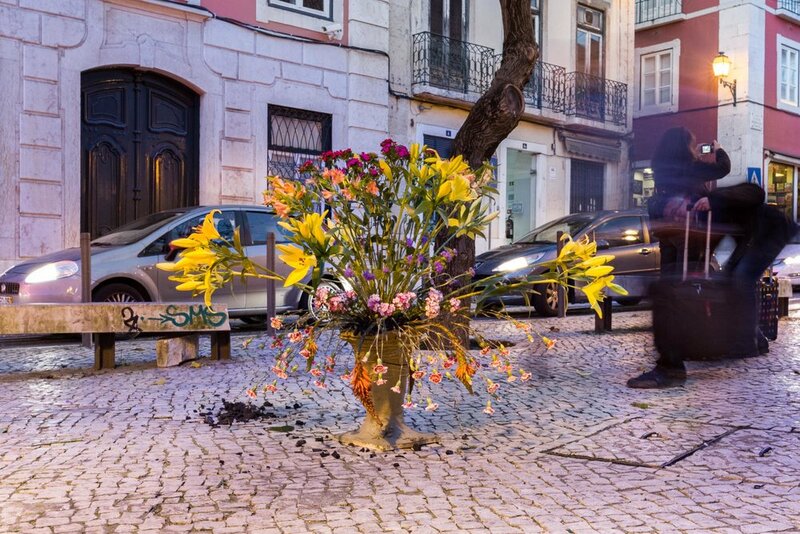 In 2016 the piece developed into Both-Asmus positioning himself underneath the flowers, which were arranged over burning charcoal. In this way he emphasised his belief that nature and humans are one and that humans need nature.